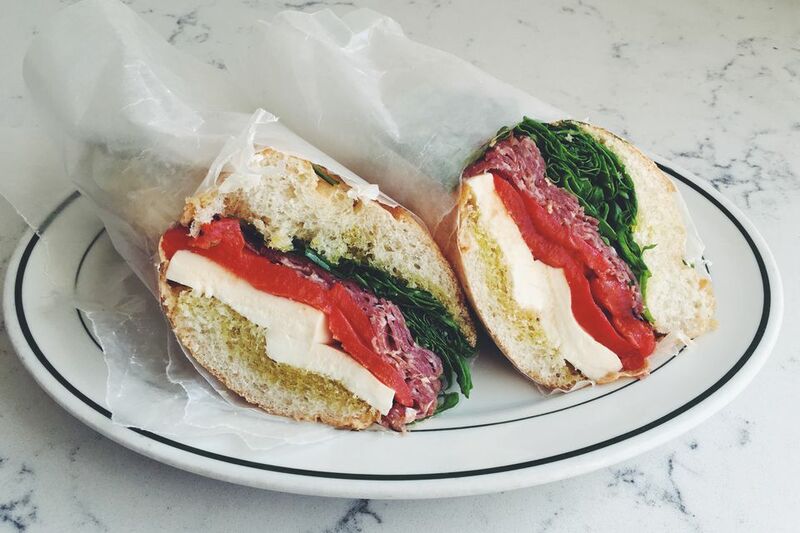 This simple yet flavorful Italian sandwich is made with fresh mozzarella, zesty salami, sweet roasted red peppers, vibrant basil leaves, and rich, buttery olive oil. Use a serrated knife to cut the Italian sub roll in half. Place sub roll on butcher or wax paper and drizzle both sides with a really nice olive oil. Add mozzarella to one-half and sprinkle with salt. Next, add roasted red peppers, genoa salami, and a handful of fresh washed basil. Close the sandwich and tightly wrap the butcher or wax paper around it. Roll and cut down the middle. Serve immediately or wrap it up for later. ​The sandwich is good for 24 hours if refrigerated properly. When choosing an olive oil for this sandwich, think of it as a flavor component, not so much as something to fry something in. Look for an extra virgin olive oil from Italy that has been cold pressed so the flavor compounds are more robust. Also, check the date. Unlike wine which gets better with age, olive oil is best when fresh. If it's older than two years, chuck it. Smell the oil - if you get fruity, peppery, and earthy scents, you know you've picked a good, flavorful olive oil. Are you a vegetarian or do you not like salami? Try swapping it out for fried eggplant, fried tempeh, prosciutto, ham, or another type of charcuterie. Like it hot? Try pressing the sandwich in a panini press for a different toasty spin on this tasty sandwich. Not only will the crispiness of the bread play nicely with the stretchiness from the fresh mozzarella, but heating the salami will also help release the natural oils which ​will make the flavor even more rich and delicious. Craving a classic Italian sub? Make it yourself with this fully loaded recipe!